You Can Support HOME with a HOME Portfolio Evaluation! Maine law requires homeschoolers who have filed letters of intent to homeschool to submit the results of assessments, annually, to both the local superintendent's office and the Maine Department of Education in Augusta at the end of each school year, no later than September 1. Throughout the summer months, Homeschoolers of Maine (HOME) provides a convenient method for annual assessment, which fulfills the requirements of our homeschool statute. Portfolio reviews through HOME are easy, inexpensive, and require a minimal amount of preparation for the homeschooling parent! By participating in a portfolio review through HOME, you will also be supporting your state homeschool organization! "We truly appreciate the support from HOME and are thankful for the services provided! Our children enjoy being home schooled and love sharing their portfolio's with family and friends. Thanks for all you do!" "I just received my portfolio back from HOME today. I have to say thank you so much. I cannot say it enough. Without your organization's generosity and support, my homeschooling would not be possible. It's such a sense of relief that you're there. Thank you." To learn more about this annual assessment option, click here! NEW! 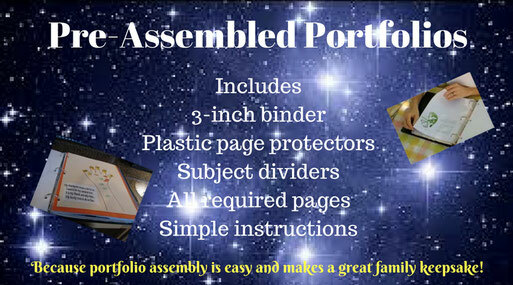 As a convenience for your family, HOME now offers pre-assembled portfolios. Included is a 3-inch binder, subject dividers, plastic sheet protectors, all required pages, and simple instructions. Just fill in the required information, add work samples and submit! Click the picture below to order yours!